And this use of fear is what mires our political debate: whether about Europe or the Independence Referendum, it is the lowest denominator of political rhetoric. In the USA, negative campaigning is perceived to work. So if Project Fear and Farage were not bad enough, Labour and the Conservatives are importing US spin doctors David Axelrod and Jim Messina. Axelrod is said to be an expert on grass roots campaigning. I think one look at the YES campaign might have shown Labour how this works in Scotland! And I do remember a “tsunami” of SNP support, to quote Alex Neil, which swept across Scotland after a campaign based on positivity and hope for Scotland’s Future. A positive Holyrood campaign, which of course brought us to the equally positive Referendum Campaign. So am I quaking in my boots from Project Fear’s threats? Not at all. Nor is Scotland. Maybe we have all read Aesop’s fable “The boy who cried wolf” or maybe we get those words of wisdom, so famously misquoted by George Bush, “Fool Me Once, Shame on You, Fool Me Twice, Shame on Me” but the Scottish people are growing wise to fear tactics. As each Unionist lie unravels our hope rises. We’ve also had the nonsense of no Eastenders, European Roaming Charges and losing the Triple A Status. Now perhaps the worst of all the fear tactics – and one that has been repeated on leaflets, declared in numerous speeches by Gordon Brown and Alasdair Darling – that our pensions are at risk in an Independent Scotland – has finally been debunked. This of course follows from the DWP letter last year, made famous by that Grassroots YES movement, that independence will have “no effect on your state pension”. Yet the No campaign’s latest billboards and posters continue to mislead and scaremonger on pensions. It is fundamentally better for us all, if decisions about Scotland’s future are taken by the people who care most about Scotland, that is, by the people of Scotland and we are stepping up and taking that responsibility for making it so. To put matters into context, in 1955 the SNP contested only two Parliamentary seats in Scotland. Dr Robert McIntyre fought Perth and East Perthshire and Jimmy Halliday fought Stirling and Falkirk Burghs. Jimmy then became the youngest ever SNP Chairman and served 1956-70; in 1956 the entire SNP Conference delegates were photographed on the steps of the Allan Water Hotel, Bridge of Allan. There will be a Referendum for Scottish Independence this year, which was unthinkable in the dark days of 1955. 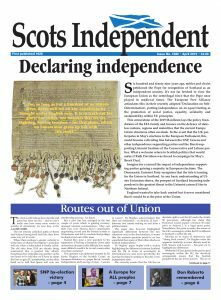 Jimmy died on 3rd January 2013 at the age of 85, and we will be publishing all his articles in the Scots Independent, all those we have electronic input for. It is anticipated we will publish a book with all his contributions over many years but this will have to wait until after the Referendum. An election manifesto is just a list of things which a Party’s leaders would like to do if they were voted into power. Vote for us and you’ll get this, this and this. You’ll be spared that, that and that. True, these leaders know something the rest of us don’t. They emphasise the good, popular bits, and then, with great glaring and blaring publicity, demand that all eyes and ears focus upon these gems. Meanwhile, less attractive plans are not mentioned at all, or are buried in some remote sub-paragraph, glossed over or obscured by waffle. However, once they have had their manifesto accepted by voters, they then claim to have the “electoral mandate” to carry every item. Almost all voters will have hostility towards some manifesto proposals, but the government will claim the right to implement all. Sometime around the 1940s the whole concept of the electoral mandate used to figure in University exam papers, as a fairly new idea, very popular with the recently victorious Labour Party. They were, as their chief legal authority explained to the House of Commons, the masters now, and had the mandate to please themselves till further notice. Of course, their mandate could always be ignored if it suited them. From 1945 until 1997, with the exception of only one short year, Labour had, through successive election victories, earned the right to govern Scotland. They had a clear and repeated mandate to do just that, but they refused to shoulder that responsibility. As once King James VI had done, they saw a much better prize in London. By refusing to liberate the Scottish people they retained the power some day to use Scottish votes to impose Labour rule upon the comfortable, happy, sleek, prosperous southern English counties. The price paid by Scotland was to suffer the policies of the heroine of these Conservative strongholds. During Labour’s periods in office it was always argued that now Scotland was governed by Labour in London all injustices had vanished. Attlee said just that in 1945, and. ever since, this insistence on confining four nations in one state has been an article of faith for Labour, whatever the consequences for Scotland might be. Search around in the records of these years and you’ll find plenty of broken promises. Worse than any broken promises is the relentless frustration of potential which a freely-deciding Scotland could justly expect to attain. And remember, their mandate gave them power during eight administrations. What great things should follow such good fortune. It’s rather different when you are suddenly made aware that manifestos and election victory tell only half the story. To gain advantage and benefits the voters must not just vote for a party but must do so in sufficient strength to give it the power to act. In our Scottish Parliament, as well as power to act we lack the power to confront. Only from a few journalists has come the proper sceptical, dismissive response to the constant prating about “broken promises” from the Labour camp. The shelving of Local Income Tax plans arose not from broken promises but from partisan political obstruction. We promised to propose the change. It was never in our power to “promise” to achieve. Similarly we have “promised” a referendum on Independence. To be accurate, we have promised to propose one. Even this promise may prove to be beyond our powers because it may not be sanctioned by either our own Parliament or, perhaps, London’s. Some hopes may be delayed, some targets unattained because Parliament withholds necessary funding. So, when we say “Vote for us and we will do these things” we are not speaking accurately. We are saying what we hope to do, what we intend to do and what we aspire to. Our promise is that we will try and if given the opportunity we will perform. We cannot promise to achieve if power is denied us. In pursuit of our promises we may strive but, frustrated by opponents we cannot succeed. A promise is broken when, with the power to act, you do not do so. A parliamentary defeat is not a broken promise.